This is College Physics Answers with Shaun Dychko. We are asked to find the total number of microstates that correspond to 51 heads and 49 tails, 50 heads and 50 tails and 49 heads and 51 tails. So for 51 heads and 49 tails, we have this many microstates which I have written there and then add to that one times tenth to the 29 for the number of microstates with 50 heads and 50 tails and then add to that 9.9 times tenth to the 28 microstates for 49 heads and 51 tails. 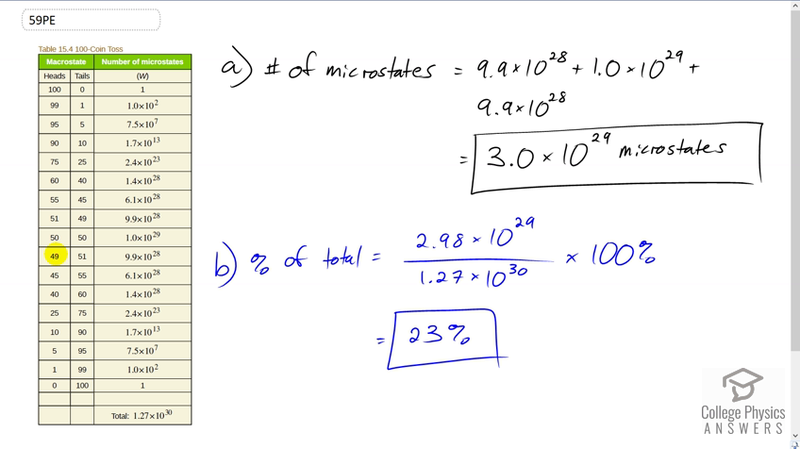 That works out to a total of three times tenth to the 29 microstates and this represents the percentage of the total possible number of microstates is this number written with an extra digit here, 2.98 times tenth to the 29 and they use extra digits to avoid intermediate rounding here and we divide by the total number of microstates here and times by 100 percent. That works out to 23 percent. So these three macrostates account for 23 percent of all possible microstates.